The first event was that Chris's Aitolians prayed the hardest & were granted access to Delphi. The Northern ‘Barbarians’ of Thessaly, Aitolia and Thebes have created an alliance against Sparta and Athens. Sparta has a Defensive Alliance with Syracuse, based on if Pylos is attacked - then Syracuse will send aid to Sparta and if Catana is attacked - then Sparta will send aid. Meanwhile Sparta and Athens have a non-aggression pact. Sparta sends an envoy declaring war on Thebes due to past grievances and the build up of troops on the border. The Northern Alliance sends envoys to Sparta and Athens declaring war on baseless reasons and excuses. With war declared the Spartans launch a pre-emptive strike catching the Thebans off guard outside of Mycenae and forcing them to battle (See battle report at the end of this). Syracuse meanwhile sends out envoys asking everyone to keep the peace, and being ignored by everyone. With War declared on it, Athens uses its navy to strike at the Aitolians in Ithaca, which resists the Athenians blockade but remains under siege. Meanwhile the Thessalians land on Eubeoa, which showing true Athenian courage promptly surrenders. The Aitolians, ignoring the Athenian forces in its rear, strike at Argos in an attempt to divert the Spartan thrust into Thebes. The loyal Argos citizens build barricades around the city and valiantly hold off the Aitolian horde. Argos remains under siege. The only battle of the turn is between Sparta and Thebes. Although the invader, the Spartans are able to pick the ground for the battle as the Thebans march on them. The Spartans start with the Spearmen in the middle in a double rank with their Cavalry on the left, on a gentle hill and Auxillia on the right, opposite a wood. The Thebans, due to their special double ranked Spearmen unit (the Sacred Band), have a just as long a spearline, but out number the Spartans in Cavalry and Light infantry with two Psiloi units. The Psiloi are in the woods and the Cavalry are on the right of the spear line. The Thebans march ahead with their Psiloi going deep into the woods. The Spartans send their Auxillia into the woods to distract the Psiloi and the cavalry move to the side so the Spartan spear line can expand, although meaning that part of it is thinner than the Thebans. This allows the Spartan Cavalry to get out to the side of the Theban Cavalry and when the battlelines hit each other the Spartan Cavalry are able to charge into the side of the Theban Cavalry, but are repeatedly pushed back. Meanwhile the Psiloi are able to surround the Auxillia and destroy them. But it is too late for them to get either back to the battle or march on the Spartan camp. In the Middle the Spearwalls push each other about with the Thebans gaining ground. Then at the end of the line the Theban Cavalry are pushed back. Without their support, the spearwall falters against the onslaught of the Spartan hoplites and it disintegrates. The Sacred band and Theban General are then pushed back leaving the Theban Spearmen that are between them exposed on both sides. The Spartans smelling blood assault the Thebans without mercy, and they break and run, taking the rest of the army with them. The Spartans hold the field and erect a trophy to their victory over the Thebans. With victory over the Thebans, the Spartans march from Mycenae to relieve the loyal citizens of Argos from the Aitolian Horde. 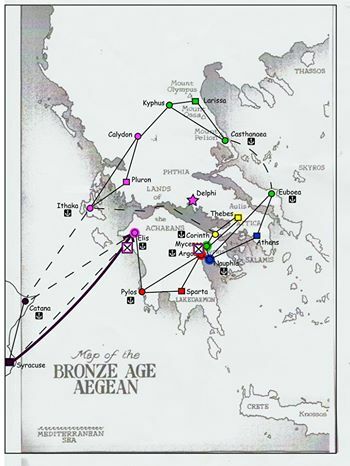 Meanwhile the Athenians race home to face the Thessalians, who have crossed over from Euboea and have marched for Nauphia. The Thessalians and Athenians fight at Nauphia, where Athena herself fights along side her army and the Athenians vanquish the Thessalians (who may have had their patron deity Dionysus helping them with the way they fought). Despite holding the advantage in both the troop match ups & terrain, when the two battle lines clashed the Thessalian line crumbled to the weaker opposition! The Thessalians retreat to Eubeoa. On the way to Argos, the Spartans come across the beginnings of the Aitolian siege lines and take an outlying fort that the Aitolians had build to hold the Spartans up. The survivors of the garrison flee back to the main army alerting them to the Spartans. The Aitolians form up and march out to meet the Spartans. The Spartans deploy with a Spear unit garrisoning the fort and a Hoplite shield wall to the right and Cavalry to the left. The Aitolians deploy with their Hoplites on a hill on the right of their line, opposite the Fort. Their Psiloi are on the left in the wood, with Light Horse in reserve and a hoplite unit in their Camp. The left side of the Spartan shield wall advances, leaving the right side behind, when they get close enough the Aitolian Hoplites charge down the hill and the psiloi burst from the woods, while the Light Horse move up the left flank. The Spartan right is disorganised and fighting in small groups allowing a unit of Aitolian Psiloi to get through the line, otherwise there are no serious causalities there. The Psiloi that got through the Spartan line, races to the Spartan camp where they are fought off by the Healots defending the Camp. Meanwhile in the main Hoplite clash, the fort’s garrison sallies out and catches the Light Horse in the side scattering them. The Spartan Hoplites then create a hole in the Aitolian line, but are unable to exploit it as suddenly Theban reinforcements arrive. The Scared band move up to fill the gap and the Theban cavalry come racing down the left flank nearly overwhelming the Spartan cavalry. With the battle in the balance, night falls and the Aitolians and Thebans retreat. The next day the Spartans give sacrifice to their deity Ares and put up a trophy to their victory and the Aitolians are allowed to recover their dead under an armistice. The Aitolians retreat to Delphi to consult the Oracle on what to do next while the Spartans march to Argos and allow the citizens to erect their own trophy to defending the city. The Athenians march on Euboea; the Thessalians choose to flee with their tails between their legs back to Casthanaea [Ed. tactical withdrawal is the proper term i believe - clearly Dionysus was overly "consulted" during this seasons campaigning]. The Democrat party in Euboea take control and hand the city over to the Athenians. The Athenians then execute all those who surrendered the city to the Thessalians in the first instance and divide the island in to shares which are sold to Athenian Citizens and rented back to the Euboeans. Meanwhile, with the correct religious festivals observed, the Spartans invade Mycenae again and the Thebans march out to meet them. The Aitolians stay in Delphi and await word from the Oracle. The first year of the War is over & very army has retired to winter at home with no ground gained or lost despite the hectic year of fighting! The Spartans celebrate a Religious Festival, in which they invite other Hellenic states to attend to bring peace to the Land. Syracuse, Aitolians and Thebans attend and peace is created among them. The Syracuseans and Sparta renew their oaths and continue their defensive alliance. Sparta and Aitolia agree to a Non aggression pact, unless the Aitolians attack Syracuse or Thebes. Sparta also swears to protect Thebes from any aggressor and the Citizens of Mycenae are allowed to leave the Theban Alliance and join the Spartan Alliance. News is then received that the Thessalians could not make the Festival as they had been invaded by Athens with their attempt to bring it under her their Imperial power. The Athenians and Thessalians meet in battle near the Coast. The Athenians had constructed a small fort near the coast next to a couple of woods. They deploy Psiloi in the Woods and the Hoplites in the gap between the Woods with the Cavalry and Light Horse to the rear. A small force of Hoplites did a landing further up the coast behind the woods out of sight of the General. The Thessalians lined up a force of Cavalry and hoplites to attack the landing force and moved the rest of the line to shadow the main Athenian force. The Athenian landing force is surrounded and butchered by the Thessalians, along with a unit of Psiloi that reach them to try and guard their flank. The rest of the Athenian forces spend the battle trying to deploy from between the woods. With the landing force destroyed, the Athenian retreat back to Eubeoa. The Spartans, after receiving favourable signs from their sacrifice on the border of their territory, and Aitolians both invade Nauphis, with the Spartans taking the lead and besieging the City while the Aitolians, on hearing of Athenian defeat retire to Delphi to get word from the Oracle on what to do. The battered forces of Athenians retire to Athens while the Thessalians sail for Eubeoa. While sailing there an unnatural Storm hits the fleet, scattering it and causing a great loss of life. Many in Athens believe it is Poseidon protecting them. The Thessalians carry on and lay siege to Eubeoa. The Aitolians, Thebans and Syracuse all await the right signs to do anything and end up sitting still. The Spartans continue the siege of Nauphis, but fail to take it before winter and are force to abandon the siege and retire to winter quarters. There is a rumour in the army that the Spartan commander was bribed by the town not to press the siege and back in Sparta he is found guilty and stripped of his citizenship. With the belief that Poseidon is with them, the Athenians try to lift the siege of Eubeoa. The armies clash again. The Athenians are on the coast and have built a small fort. They deploy with the Cavalry and Light Horse on the left, the Hoplites in the middle and Psiloi on the right. The Thessalian Cavalry is opposite the Athenian, with its Hoplites also in the middle and a Psiloi on the Left. The Hoplites end up staring at each other for the whole battle. The Athenian Archers, Cavalry and Light Horse are very aggressive on the Left, but after some hard fighting, the Athenian Archers are scattered by the Thessalian Cavalry. With a hole created, the Thessalians get in amongst the Athenian Mounted force and are quickly routed. The battle then ends when the some of the Thessalian Hoplites manage to surround a Athenian Psiloi and dispatch them. With the Athenian Force routed, Euboea surrenders. The Thessalians, filled with rage, then kill all the free men of Military age and sell the women and children into slavery. With a religious festival delaying the Spartan ambassadors, they find that the Persians have influenced the Athenians and Thessalian with gold and convinced them to sign a treaty to fight Sparta as it is the defender of Hellenic freedom. This, even with the Thessalians having invaded Athens twice and currently holding Eubeoa. 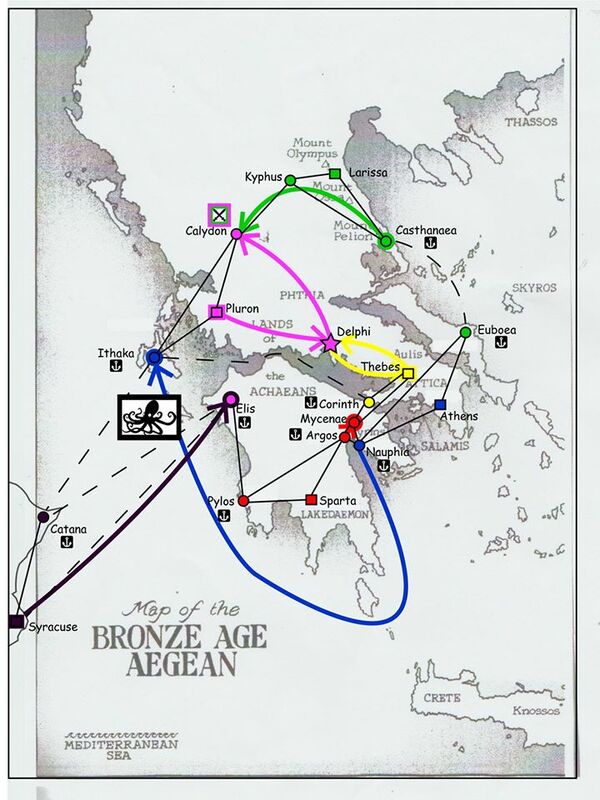 The Athenians then use some of the Persian gold to convince the Thebans to join them on the attack. Not only this but Syracuse, jealous of Spartan courage, and also wanting to create an Empire in Greece, declares war and invades Sparta from the West. Only the Aitolians stand with the Spartans to defend the land from tyranny and Persian influence. Following the edict of a good defence is a good offence; the Spartans attack Thebes, and hope to knock them out of the fight before they can send support troops to aid Athens. Athens, supported by the Thessalians, invades Argos. But, as when the Aitolians invaded, Argos resists and holds off the invaders, causing many casualties. Syracuse meanwhile invades Pylos, but not finding a major settlement and being harried by the loyal Spartan Helots, they lay waste to the land. Finally at Elis, the Aitolians, with help of the Anti-Syracuse faction of the city, are able to sneak in and take the place. The main Pro-Syracuse Leaders are executed and the rest exiled, otherwise the city is unharmed. At Thebes, the Spartans send heralds to the Thebans to negotiate a settlement as every dead would be a victory for Persia and Thessaly. With talk rejected the Spartans line up with the most of their line to the left of the river, with the Cavalry and Auxillia on the far Left. Across the River a hoplite detachment is deployed to assault the small city there (the city is not Thebes, but a smaller out lying city). Meanwhile the Thebans set up with their Hoplites to the right of a wood, and the Cavalry to the far right (opposite the Spartan Cavalry) and their Psiloi in the wood. The battle begins with the Spartans assaulting the city and taking it by force. After they finish plundering it, the detachment then marches down the river and crosses by the wood, in an attempt to get behind the Thebans. Meanwhile the main Spartan line marches towards the Thebans. At the last moment the Thebans charge the Spartans, the Spartan Hoplites are pushed back but hold. The Theban Psiloi, however flee from the Spartans on the Spartan right and on the Spartan left the Spartan Auxillia massacre the Theban cavalry. This creates a hole and the Auxillia are able to swing around and hit the rest of the Theban Cavalry in the side while they are engaged with the Spartan Cavalry. After vicious fighting the rest of the Theban Cavalry are vanquished. The Spartan Cavalry and Auxillia then move into the side and rear of the Theban hoplite line and start to roll it up. Meanwhile on the other side the Hoplite detachment are coming through the wood disrupting the Psiloi and the Spartan hoplite line starts to come in from the right. In a mighty last stand the Theban General punches through the Spartan line just as the rest of the Theban hoplites throw down their shields and flee the battle. The Thebans retreat into Thebes to defend the walls and are allowed to gather their dead under a truce. At the start of summer the Spartans march away from Thebes. The Thebans send a detachment to follow them, but cannot keep up after the loss of all their cavalry. At Mycenae they meet up with the Thessalians, who have marched from Eubeoa through Athenian lands to block the Spartans moving to Argos. With Theban troops accompanying the Thessalians, Mycenae welcomes them with open arms; however the Thessalians slaughter all the men of military age and sell the rest of the population into slavery, while the Theban troops standby watching, unable to do anything to help the population. In the Peloponnese, the Syracuseans retreat from Pylos and march to Elis to confront the Aitolians, who are occupying it. The Aitolians deploy their Psiloi in a series of steep hills, with their hoplites and light horse behind a River. On the other side of the River they have built a fort defended by a Hoplite unit. The Syracuseans deploy with their infantry in front of the fort with Artillery on the left of the line. On the far left is the Cavalry and light horse. The battle starts badly with massive casualties suffered by the Syracuseans Hoplites in a futile assault on the fort. The infantry retreat from the fort and the artillery moves up to fire on the Aitolian infantry guarding the far side of the river. The Syracusean's Cavalry start a dance with the Aitolian Hoplites up and down the length of the river, while the light horse move to the far left. There the Light horse are ambushed by Psiloi from a steep hill, supported by the Aitolian light horse; but the ambush fails and the Syracusean Light Horse holds out until the Cavalry arrive and the Aitolian light horse and Psiloi are scattered. The Syracusean Cavalry General and light horse then cross over the river and charge into the Aitolian Hoplites, with no effect. In the meantime at the fort the Hoplite garrison sallies forth and assaults the Syracusean Artillery, scattering the crew. On the other side of the fort the rest of the Syracusean Cavalry catches some Psiloi out in the open, but they resist strongly and hold the Cavalry off. Night then falls and both sides retire, the Aitolians back to the city and the Syracuseans are able to make it to their ships and back to Syracuse. The Spartans had left Thebes to relieve Argos in late Summer, and with the speed of their march had gone past Mycenae before the Thessalians had got there. At Argos, the Spartans are greeted by the loyal citizens of the city before they reach it. The Athenians had seen the dust cloud and learnt it was the Spartan Army. As quick as they could the Athenians mentioned something about an Election and then had hot tailed it back to Athens. The Spartans and Argives then preformed the proper religious ceremonies in thanks of the victory. With Mycenae destroyed, the Persian dominated Thessalians gather there lackey allies together and march on Argos in an attempt to finally put the Spartans to the Sword. On the road to Argos they meet the Spartans, who decided to meet the Allied force in battle and had started to march to Mycenae. The Spartans, heavily outnumbered, lined up their hoplites to the right of an old Argive fort. The Fort had been hastily repaired to protect the left flank. The Cavalry and Auxillia line up on the Right. The Thessalians have their Cavalry and Psiloi on the left of the hoplites which are lined up opposite the Spartans. The Athenian hoplites are on the right of the line next to a gentle hill and the Thebans on the left. Between the two Armies is a river. The Spartan King then reminds his force, like the 300 at Thermopylae, they are greatly outnumbered by a ‘Persian’ army bend on dominating the Greeks and destroying Greek freedom, and that it is every Spartans duty to resist this until victory or death. The Spartans spend the first part of the battle extending their phalanx, with the Auxillia moving to the rear as a reserve and the Cavalry still on the right. Meanwhile the allied force of Thessalians, Athenians and Thebans advance across the river slowly. Having not fought together before and in awe of the unbeaten Spartans, the allied army’s movements are slow and cumbersome. By the time they line up in front of the Spartan line and are organised to attack it is late in the day. There is some hesitation in the Allied line even then as the orders to attack take awhile to get to everyone, but eventually the allied force charge. Initially the Spartan line is pushed back by the charge, allowing Thessalian commander to isolate the end of the phalanx and punch through it. The gap is quickly filled by the Spartan Auxillia held in reserve. The Spartans counter push cracks the Thessalian phalanx, which the Thessalian cannot plug initially and part of the phalanx is left isolated. But with night falling both sides retire from the battle with it ending inconclusively. The few dead are then collected by both sides under a truce and the forces retire to their winter quarters. With the start of winter the Spartan army is still intact, Argos is safe and the flame of freedom still alive, so the battle is considered a victory by the Spartans. With limited forces left available to both sides this looked like it would be a fight to the death for possibly both commanders! The Syracusean infantry & artillery formed up & hled firm in the centre with their cavalry (including General) swing out to their right flank, while the Aitolians (solely on foot) moved forward through the centre with their Psiloi moving wide to their left flank. The Syracusean cavalry eventually overran the 2 Aitolian infantry units that turned to face them whilst the Aitolian centre crashed into the Syracusean foot & rolled up their right flank using their fast moving Psiloi to outflank them - despite a spirited defiance put up by their artillery section! The Syracusean light horse headed for the Aitolian camp & engaged the camp followers for a time before eventually driving them off & laying claim to the booty within. Meanwhile the other Syracusean cavalry charged into the rear of the Aitolian foot to rescue their own surviving hoplites, but were driven off. The Aitolians then surrounded the remaining Syracusean infantry & destroy it. Then while the Syracusan general i held off by a hoplite unit the other Syracusean cavalry unit is then isolated, surrounded & destroyed by psiloi & hoplites. With his army in tatters the Syracusean general recalls his light horse & flees for the coast & the safety of his ships! Victory to Aitolia! Elis remains in their hands for winter! A new year got under way. The Spartans renewed their non-aggression pact with the Aitolians and signed one with the Thebans and the Athenians, who, having faced the Spartans last year, did not want to again this year. The Athenians also granted the Spartans the right to march through their territory, as they felt the Spartans may do this anyway and they where not about to try and stop them. With Sparta able to fight off multiple enemies, and the allied forces of Thebes and Athens having been bested by them, their Persian masters cajoled them to attack the Aitolians with Syracuse aiding. Separately the Thessalians were also bribed by the Persians to attack the Aitolians. With the start of the Campaign season, the Spartans declare war on the Thessalians and invade Mycenae. With the Thessalians and Thebans having abandoned the city after massacring or selling most of the population, the Spartans find only a handful of survivors. The Spartans provide shelter and food which the survivors gratefully accept. Meanwhile The Thessalians attack the Aitolians in Calydon, the Syracuseans attack Elis, the Thebeans, ever hungry for gold, attack Delphi with it’s treasury of donations to the gods; and the Athenians launch a naval assault against Ithaka. The Aitolians, desperate to defend their lands march first to Delphi, where the Thebans, greatly undermanned from the losses last year to the Spartans, and with half their army away supporting the Syracuseans at Elis, retire. The Aitolians then march to Calydon to face the Thessalians. The Citizens of Elis resist the Syracuseans on the walls, while the Athenians, after braving a ferocious storm that sunk a third of their fleet and scattered the rest, reach Ithaka. The populous, seeing only a handful of ships at a time allow them into their harbours to be repaired, which allow the Athenians to take the city from within! This assault was a surprise not only to the Aitolians, but to the Syracuseans also as they did not realise that Athens was fighting on their side. In Calydon, the Aitolians and Thessalians faced each other. The Aitolians picked a hilly area with a small fort and a river to defend. The River ran through the battlefield north-south, dividing the Aitolians in two. They had half their Psiloi in a hill on the left bank of the river and half on a hill on the right bank of the river. The camp and hoplites were on the left bank, with a unit of hoplites in the Fort which was in the Thessalian deployment area. The Thessalians set up on the left bank of the river (the opposite side to the fort). The Hoplites formed up into three ranks, due to the small gap that they could fight in and their Cavalry formed up to the rear of the hoplites. The Psiloi were on the left of the line. The Thessalian marched forward on their side while the Aitolian hoplites crossed the river to face the Thessalian Hoplites. The gap between the hill and the river was very small allowing only a small shield wall to be formed. The Hoplites of both sides clashed in this small gap and would spend the rest of the battle pushing each other about. The psiloi on the Thessalian left would clash with the Aitolian Psiloi for no gain. The Thessalians would also try and send some cavalry to the other side of the river, but by the time they crossed, the sun was setting. The battle ended with both side pulling back. Each of them then collected their insignificant amounts of casualties under a truce and the Thessalians then pulled back to Kyphus. The war continues with the Thebans invading Delphi again. The Priests of the Oracle however rally the population and they defend the temple from the Thebans, who are forced into a siege of the area. Meanwhile Elis remains strong and continues to hold off the Syracusean force. The Athenians, elated by their success, march on the Aitolian capital, Pluron. The Aitolian army, races back to defend the capital, knowing that their back is secure as the Thessalian’s have had to race to Eubeoa to defend it against the Spartans. The Spartans, having marched through Athenian territory and crossed the straits, now get to face the Thessalian’s, who will be without any allies, and therefore have to fight the Spartans in a fair straight up fight. The Thessalian’s repair a small fort near a river and form a line with their hoplites to the right of the fort, trying to copy what the Spartans had done to them. A Hoplite unit garrisons the fort with a unit of Cavalry behind it, the rest of the Cavalry with some of the Psiloi form up to the right of the hoplites. The Spartans, on the other side of the river, form up in two columns with the Cavalry on the left and the Auxillia on the right. The Spartans then march up to the river and find that it is a normal flowing river; they then form up in a line across the bank and prepare to cross. The Thessalian’s, meanwhile, have moved their Cavalry up close to the river and the Cavalry from behind the Fort has moved up as well. The Spartans then cross over with a few units lagging behind, the Thessalian cavalry and Psiloi on the right retire back to the Hoplite line, but the Psiloi that has come out from behind the hoplites and the Cavalry on the left are caught by the right of the Spartan Spearwall and the Auxillia. The Auxillia push the Psiloi back and then destroy them in front of the Fort, while the right of the hoplite line for the Spartans splits off and ends up pushing the cavalry back into the Thessalian hoplite phalanx disorganising it. Those Thessalian hoplites move back and form a reserve. This would be important in the coming hoplite clash. The Spartan line then charges into the Thessalian line, with disastrous result. The Thessalian hoplites, some on a small hill, push the Spartans back and knock a hole in the line. Some of the Thessalian hoplites pour into the hole surrounding more of the Spartans and put them to the sword. Meanwhile the newly formed Thessalian reserve is able to move around and cover the hole in the line from the attack. The Spartan stragglers from the river crossing are able to form a secondary line and crush the Thessalian hoplites that had gone into the gap. With the Spartan line stabilised again, the Thessalians retreat on to the hill. The Spartans then do one last charge which is repulsed again, but with no great loss. Night now falls on the battle, and both sides retire. The dead are then gathered the next day under a truce and the Thessalians retire into Eubeoa, while the Spartans retire to Athens. In Pluron, the Aitolians face the Athenians. The Athenians, outnumbered by the Aitolians had expected support from Syracuse, but the support did not turn up as on the way they meet an Aitolian herald, who promised the return of Elis if they did not turn up. The agreement was accepted, Elis was surrendered and the Syracusean allies deserted their Athenian allies in their moment of need. Therefore the small band of Athenian Hoplites formed a phalanx with Archers on the left and Psiloi on the right. The Aitolian Phalanx set up oppose with a small Psiloi force on its left and the rest on the right. The Athenians boldly marched forward and the two phalanxes clashed. Most of the Aitolian line was pushed back, but the Athenian archers were scattered by the extreme right of the Aitolian phalanx. With the Aitolian Psiloi creeping around behind the Athenian line, the Athenians desperately tried to push through the Aitolian line, but they were surrounded and killed. The Athenian General was last seen trying to rally his men in the middle of the battle. His body was later recovered with the rest of the dead under truce. The Athenains, almost wiped out retreated to Ithaka. With Elis surrendered to them, and the Spartan army away, Syracuse invades Pylos again. As before the loyal and heroic healots rise up and defend the area from the invasion causing disruption and casualties resulting in the area remaining free. The Aitolians, believing they have scattered the Athenians march to the relief of Delphi, where the Thebans line up for battle. Like the battle with the Athenians earlier, the Aitolians line up the hoplites in front of the Theban hoplites. Their Psiloi then outflank the Theban hoplites, forcing the Thebans to advance and try and break the Aitolians before they are surrounded. As in the other battle, the Thebans crash into the Aitolians hoplites and are then surrounded and killed, the Theban General being the last to fall. The next day, the Theban survivors are allowed to collect their dead and return to Thebes. The Aitolians dedicated the captured arms and loot from the battle to the Orcale at Delphi. On hearing that the Aitolians have marched on Delphi, The Athenian survivors, worried about being exile if they go home, are convinced by one of their number, who dreams of going home in glory, to try and take Pluron. They advance on the city, at first the citizens are alarmed and close the gates, but when they realise how few there are, they sally out and rout the Athenians. The survivors are rounded up and sold as slaves. Over in Eubeoa, the Thessalians, hearing of the destruction of the Athenian force, renege on the treaty with Athens, and invade. The Spartan commanders at Athens gather and discuss what to do. They don’t have an alliance with Athens, only permission to advance through their land and as such are under no obligation to defend Athens. They could leave and try and take Eubeoa. In the end, the Spartan King with the army decides that the Thessalians are oath breakers and as such have blaspheme against Zeus (the Keeper of Oaths) and need to be shown they cannot gain from breaking oaths. The sacrifices are performed and the omens are favourable. They March out to face the Thessalians. When the Thessalians hear that the Spartans will fight them, they turn tail and run back to Eubeoa and hide behind its walls. The Spartans surround the city and try to take it by force before winter approaches, but are held off. More Omens are read, and show that Zeus is appeased. The Spartans then fall back to Sparta for the winter, but leave a trophy near Athens to remind them that it is to Sparta, rather than their own army, that they are free. As the dust settled on the battlefields; fleets sailed for home; hoplites set aside their regalia of war - It was time to see who had seized victory from the chaos of the war! Despite all the carnage only a handful of cities had actually changed hands, & no faction had brought any other to heal as it's client state. Who had come out on top? The full campaign scoring system was known only to Garry (as GM) - though it could be guessed that city captures were worth points; but also so were victories in battle & other factors. The final standings were very close between the top 2 & it came down to the last round of actions to determine the outcome! Full Campaign Rules will be added at a later date to show exactly how the movement, actions & diplomacy in this campaign actually worked.